BBC SPORT | Sport Relief 2004 | He's having a bath! It is hardly most people's idea of a nice long soak in the bath, but comedian Tim Fitzhigham is preparing to go the extra mile and beyond for Sport Relief. Fitzhigham plans to row 22 miles across the English Channel in a specially converted bathtub - and then make his way up the Kent coast and along the Thames to London's Tower Bridge. Not surprisingly, it is the first time anyone has attempted the journey in a bathtub and Fitzhigham is hoping his innovative trip raises at least £22,000 for Sport Relief. "I would love to be able to give Sport Relief a cheque for £1,000 for every mile in the channel, so that's £22,000," he said. "Last year, I took a paper boat the entire length of the River Thames in order to raise money for Comic Relief and that raised just shy of 10,000 for Comic Relief. "It was such a fun trip that I wanted to do something else again to try and raise more money." Improving his fund-raising total was never going to be easy, but nor was surpassing the wonderfully-madcap scheme of taking to the Thames in a boat made entirely out of newspaper. Yet Fitzhigham seems to have come up with something even more whacky - and even more daring - with his floating bath. "It is basically a bathroom," he said. "It is a copper bath with a lovely Victorian shower head, taps and a little pedestal. There is a flat bathroom floor and it just sort of floats. It's got oars and I just row it along." But not a plug, surely? "It does have a plug, but the compass has been put in the plug hole, so hopefully it should stop it leaking," Fitzhigham said. The comedian is scheduled to leave France on Friday morning and hopes to reach Tower Bridge on July 9 - but the weather may yet throw his plans off course. "We think the row will take a week but nobody really knows. "We are going on a plan that was used by the Romans to invade London about 2,000 years ago and that plan has never failed in 2,000 years. "Then again it has only been used once in 2,000 years." Fitzhigham's final preparations ahead of his daring voyage received a timely boost when he met Great Britain's Olympic coxless fours crew at Dorney Lake just days before he left. And three-times Olympic gold medallist Matthew Pinsent admitted he was struggling to find the right advice. "He is brave and I hope he has got the number of the RNLI when he comes across a cross channel ferry," Pinsent said. "Other than that, my main advice would be to have a good will and make sure all his affairs are in order before he goes. "But he seems very upbeat, as well as suicidal, so good luck to him." 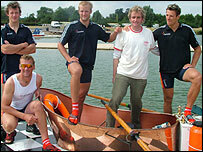 James Cracknell was more technical, offering advice to improve Fitzhigham's rowing technique. And the comedian-turned-sailor admitted the four had provided him with the perfect send-off. "Matthew basically thinks I need a straight jacket but they gave me some very good advice and it was a thrill to meet them." Fitzhigham's progress can be tracked via his website, which will also include an online facility to donate to Sport Relief.